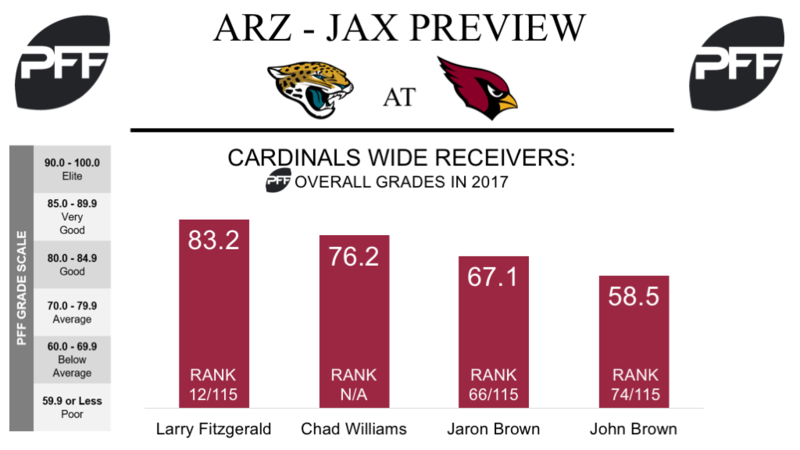 The Jacksonville Jaguars visit the Arizona Cardinals in Week 12 of the 2017 NFL season. PFF previews the top player matchups of the game. RB Leonard Fournette vs. S Budda Baker – Fournette is coming off a heavy workload this past Sunday and his overall grade of 81.0 now ranks 14th among all backs. Fournette has six runs of 15 or more yards for the season, accounting for 33 percent of his rushing yards. This week, he faces Baker, who is coming off a performance which was one of the best by any player so far in 2017. Over the last two weeks, Baker’s run-stop percentage within eight yards of the line of scrimmage at the snap of 14.3 ranks fifth at the position while his four stops rank second. In the past two weeks, Baker has not missed a tackle in run defense, so a matchup with Fournette who embraces contact will be an intriguing test. WR Marqise Lee vs. CB Patrick Peterson – Lee’s 45 targets since Week 6 are the 11th most among receivers in that span. Over that time, Lee has a passer rating when targeted of 90.0, which is an improvement on his season long rating of 72.9. 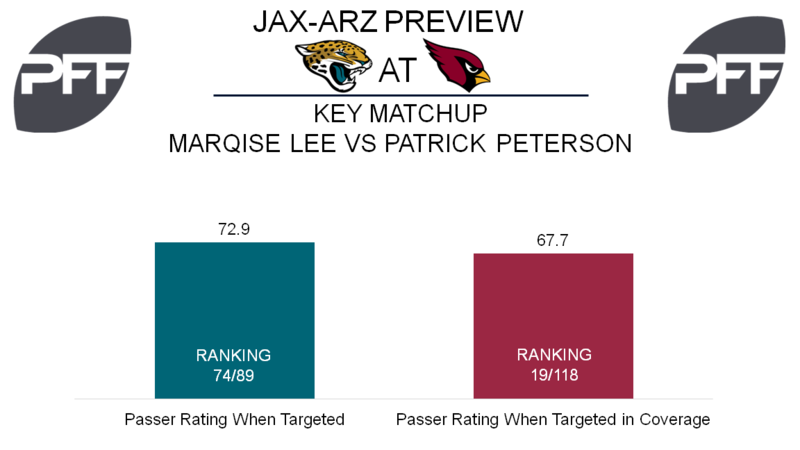 Being the most targeted player in the Jaguar passing game, Lee figures to see plenty of Peterson, who is known to shadow opposing receivers. Peterson is in the middle of another fantastic season as his 0.64 yards allowed per coverage snap ranks third among corners, while his 24.4 coverage snaps per reception allowed checks in second. With Peterson only shadowing receivers on the outside, Lee could spend time in the slot and have chances to create in space. Since Week 6, Lee’s 172 yards after the catch is sixth among all receivers. WR Dede Westbrook vs. CB Tramon Williams – Westbrook didn’t quite record the 200 yards he was expecting in his NFL debut, but Blake Bortles seemed to have faith in him. Despite running just 21 routes this past Sunday, Westbrook was targeted six times. With Peterson likely shadowing Lee, Westbrook figures to have his hands full against Williams, whose overall grade of 84.3 ranks 16th among corners. An interesting wrinkle in this matchup is that Williams hasn’t had to cover someone with Westbrook’s speed. The average depth of target thrown towards Williams in coverage is 5.8 yards, but all three of the post routes that he has been targeted on have been completed. If the Jaguars establish the run, don’t be stunned if Westbrook’s targeted vertically in an attempt to break the game open. WR Chad Williams vs. CB A.J. Bouye – Following the team’s disappointing Week 11 defeat at the hands of the Houston Texans, Cardinals’ head coach Bruce Arians voiced his frustration with the team’s receiving corps, and announced that third-round rookie Chad Williams, “would get his shot,” this weekend. Williams has only managed 23 snaps so far this year, but has hauled in both of his targets for 23 receiving yards, while attaining an average PFF overall grade of 76.2 in his limited playing time. In what could be his first start as a pro, Williams is in for a stiff test against cornerback A.J. Bouye, who is allowing just 42.3 percent of throws into his coverage to be caught, while allowing a passer rating of just 30.6, second best among cornerbacks. TE Ricky Seals-Jones vs. LB Myles Jack – Just like Williams, Seals-Jones earned praise from head coach Bruce Arians this week and is also in line for an expanded role in the offense. Coming off an incredible Week 11 performance in which he hauled in all three catchable targets for two scores and 54 yards at a staggering average of 10.8 yards per route run, he’ll be looking to build on that small sample size and make the most of his opportunity. On Sunday, Seals-Jones could take advantage of his matchup against linebacker Myles Jack, who has allowed 16 receptions from 20 targets when covering tight ends this season for 188 receiving yards, two scores and an 80.0 percent catch rate, while yielding a passer rating of 139.2. QB Blaine Gabbert vs. the Jaguars pass-rush – Filling in for the injured Drew Stanton, Gabbert had an up and down performance in his team’s Week 11 defeat. When kept completely clean from pressure, Gabbert was a much better quarterback, and posted an adjusted completion percentage of 80.6 percent and a passer rating of 102.6 (11th best). However, when pressured, he failed throw a catchable pass, and his passer rating fell to 39.6, 23rd among signal callers. Gabbert will hope to be a little more efficient while under pressure this week as he faces the likes of Calais Campbell (89.6 pass-rush grade) and Yannick Ngakoue (85.8 pass-rush grade), who have already tallied 92 quarterback pressures between them this season.